Laos: A boy (Ahlo, 10), who is believed to bring bad luck, is blamed for a string of disasters. When his family loses their home and are forced to move, Ahlo meets the spirited orphan Kia (9) and her eccentric uncle Purple: an ex-soldier with a purple suit, a rice-wine habit and a fetish for James Brown. ​Struggling to hang on to his father’s trust, Ahlo leads his family, Purple and Kia through a land scarred by war in search of a new home. In a last plea to try and prove he’s not cursed, Ahlo builds a giant explosive rocket to enter the most lucrative but dangerous competition of the year: the Rocket Festival. As the most bombed country in the world shoots back at the sky, a boy will reach to the heavens for forgiveness. Gripping yet heart-warming, The Rocket is a deeply personal story about the determination of a boy who has the odds stacked against him, set against the epic backdrop of a war-ravaged country on the brink of huge change. The Rocket is one of the first feature films for international release set and shot in the intriguing and little-known country of Laos, rarely seen by the outside world since the end of the Vietnam War. 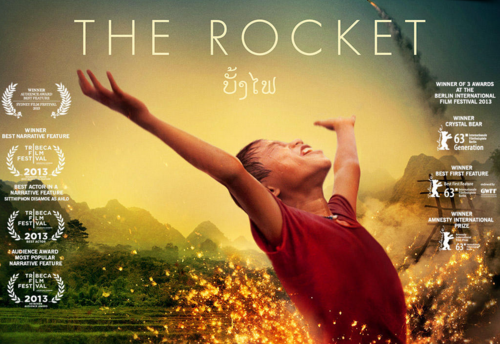 With remarkable access to real rituals and festivities in the stunning mountains of Laos, The Rocket is a unique view into a world never seen on film before. Written and directed by Kim Mordaunt (Bomb Harvest), The Rocket features an extraordinary leading performance from gutsy former street kid Sitthiphon Disamoe as Ahlo, and veteran actor and comedian Thep Phongam as the damaged but humorous Purple.